As evening passes, there is a specific instant when a ray of sunlight strikes the wall in my child’s living room, through the front door pane of cut-glass. 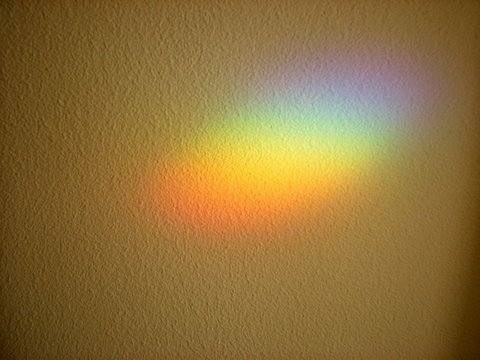 The light becomes prismatic, and strikes the wall in multicoloured glory. Life, too, I think, is like this….one white existence, made up of the reds of anger, the yellows of cowardice, the greens of enthusiasm, the purples of enjoyment, the blues of sadness,the oranges of difficult decisions…. It’s a good thought to hold on to.